In documentaries, individuals are often presented as they are, as a “real” person. But what happens when they are cast as themselves in a narrative feature? At best, it lends a sense of authenticity to a film that a director cannot achieve with professional actors. At worst, it can lead to stilted, awkward screen presences that come from a natural discomfort with the camera. 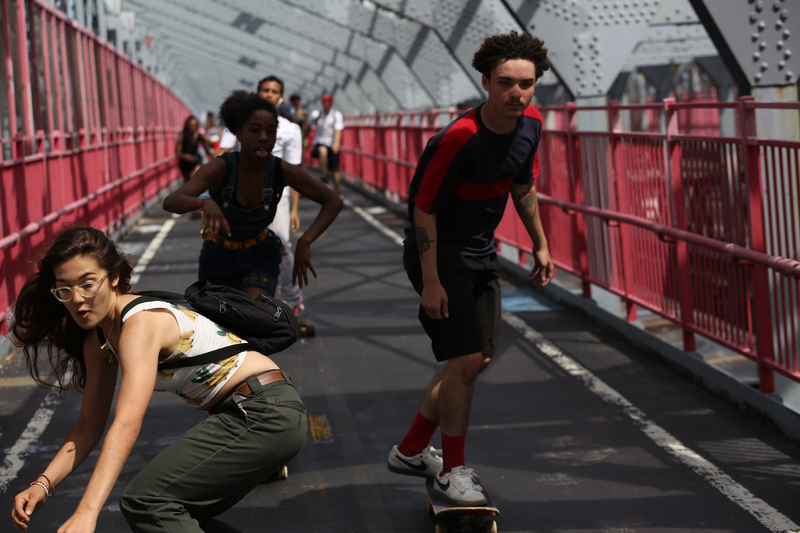 “Skate Kitchen,” the first narrative film by documentarian Crystal Moselle, is a successful example of people playing themselves, existing as a collaboration between director and subject — the eponymous, all-girl group of New York City-based skaters. The result is a wonderful, vibrant, honest portrayal of urban youth culture and the challenges that young women face. Camille (Rachelle Vinberg) lives with her single mother (Elizabeth Rodriguez) in Long Island, N.Y., where Camille escapes the boredom of everyday life through skating. But after Camille suffers a devastating injury, her mother bars her from the activity, forcing Camille to go underground to indulge in her passion. At a local skate park, she meets the Skate Kitchen, an Instagram-famous collective of teenage girls, and they invite her into their tight-knit circle. She becomes particularly close with Janay (Dede Lovelace), who takes Camille in after a fight with her mother. However, Janay is soon bedridden with an ankle sprain, leaving the dynamics of the group in peril. An all-boy group of rival skaters, led by Janay’s ex-boyfriend (Jaden Smith), catches Camille’s eye, and she must choose to whom her loyalty belongs. “Skate Kitchen” shares much with Moselle’s other esteemed work, including her 2015 hit documentary, “The Wolfpack.” Both films center on communities of teenagers that escape the real world through vicarious, thrilling hobbies. The brothers at the center of “The Wolfpack” recreated the fantasies of their favorite films in order to break the shackles of their sheltered existence, and the girls of “Skate Kitchen” employ skating to a similar effect. In regard to storytelling, however, “Skate Kitchen” follows Moselle’s line of inquiry in “The Wolfpack” beautifully. The boys of “The Wolfpack” played dress-up, acting out existing stories for Moselle’s lens. But here, the girls of “Skate Kitchen” are active participants in the creation of cinema, telling their own story through Moselle’s direction. Playing fictionalized versions of themselves, the cast of “Skate Kitchen” is dynamic, exploding onto the screen with fully-formed, power-packed identities. Each member of the ensemble brings his or her own life history into the mix, and all of them are remarkably confident for first-time actors. Vinberg is a truly incredible discovery, brilliantly acting out the central arc of the film. Moselle’s decision to center on Vinberg allows the audience to immerse themselves in the Kitchen’s world along with Camille. She’s an outsider who finds her place, loses it and must find it again, and her journey is Moselle’s emotional center of gravity. This conflict of finding where you fit in is universal in coming-of-age stories. It’s a strategy as old as storytelling itself, and it’s so effective in the hands of a skilled filmmaker like Moselle. In a documentary, the camera itself is often our point of view, but here, it’s Vinberg. Her strength as a performer, from the inside out, allows for Moselle to use the Kitchen as a springboard for a broader portrait of a subculture. Moselle’s ultimate success is in providing both micro and macro observations through her collaborative storytelling. The intense dynamics of the Kitchen are fleshed-out completely, with each member her own developed character. Then, the conflicts between the groups take center stage, immersing Camille and the audience into the codes and rituals of the skating subculture, one that she must navigate in order to find her own place. And, in terms of pure form, “Skate Kitchen” is as exhilarating as its subjects. Moselle’s camera sits at skateboard-height, gliding in perfect conjunction with each board’s twists and turns. Taking a hint from her documentary toolkit, she also employs moving portraiture shots, which zero in on the individuals that make up tightly-knit social groups. Narratively and formally, Moselle reaches an intersection here. “Skate Kitchen” is a messy film, reflecting the complicated lives of its characters, but it also coheres into something potent. At the center of the film is a diverse group of young women, expressing themselves through a single, ecstatic action, one as dangerous as it is thrilling. They may not share in their individual struggles, but they share in their efforts to overcome them. Moselle forces us to look inward, from the general to the specific, then outwards once again — from the city, to the skate park, to the city. This way, when you return to life as a whole, it refracts through a different, altogether beautiful prism.